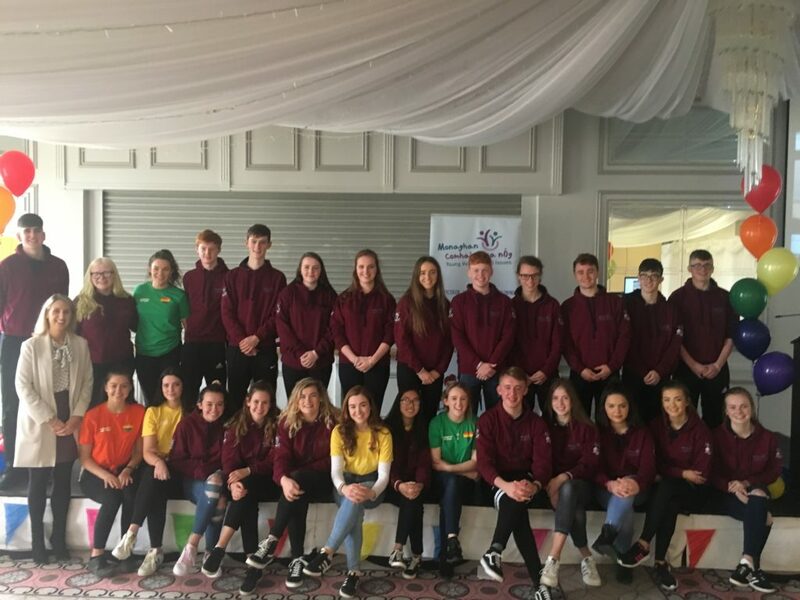 Monaghan Comhairle na nÓg are a youth council, which give children and young people the opportunity to be involved in the development of local services and policies. The core programme of Comhairle na nÓg centres on young people identifying, prioritising and progressing topics important to them. Our members then try to influence local decision-makers to achieve their desired outcome, impact or change. The members of the committee are elected through their Secondary Schools and Youth Organisations and sit for a 2 year term of office on the committee. Comhairle na nÓg gets young people’s voices heard in two ways: working on young people’s topics; and acting as a consultative forum. The Department of Children and Youth Affairs provides money to local authorities to run effective Comhairle na nÓg. Stand Up Awareness Week is taking place from November 12th-16th, 2018. As part of Stand Up Week, Monaghan Comhairle na nÓg are inviting all second-level schools in County Monaghan to join them and take a stand against homophobic, biphobic and transphobic bullying. This year, the youth council have implemented a number of initiatives to show support to their LGBT friends in their schools and communities. The latest is the launch of their short video “The Real Me” which took place at their AGM in the Four Seasons Hotel on the 25th October. Stand Up week is an opportunity for schools to look at how they can make them safe and supportive places for LGBTI+ students. It is unacceptable that one in five young LGBTI+ people face bullying, and that 70% of young LGBTI+ students feel unsafe at school. BeLonG To are working hard to educate and train the entire school community around supporting LGBTI+ young people. Monaghan Comhairle na nÓg are happy to be showing their support for this national initiative during Stand Up Awareness Week. Monaghan Comhairle na nÓg in association with Monaghan Sports Partnership hosted their 5k fun Colour Run in Rossmore Forest Park on Sunday 23rd September 2018. Equality and inclusion was the theme of the Colour Run with the park coming alive to a backdrop of colour everywhere in an exciting fun-filled event. 300 participants, young and old, soaked up the carnival atmosphere in the park, enjoying the entertainment at the start and finish line. As they made their way along the route, they enjoyed drummers and bag pipers while getting covered in multi clouds of colour! A wonderful event to launch the beginning of Social Inclusion Week. In 2016 Monaghan Comhairle na nÓg choose to work on Intergenerational projects with the aim of improving relationships between younger and older people. They produced this DVD entitled “Breaking the Stereotypes” in partnership with thirty older people from around the County. In partnership with members of Monaghan Older Peoples Forum, the DVD looks at common stereotypes that face both generations and reinforces the message that age shouldn’t be a barrier to achieving great things. In the DVD they highlight accomplishments young and old have achieved both locally, nationally and internationally! In the past, Monaghan Comhairle worked on a variety of topics. They worked closely with Monaghan County Council’s Social Inclusion Measure Group and the Positive Mental Health Sub-Committee, HSE and Mental Health Ireland, and succeeded in mapping out mental health services across the county showing what services are in place for young people. They designed, printed and produced 10,000 leaflets and 500 posters which were distributed throughout the County. They developed a road safety DVD “It Could Happen to You” in conjunction with the Driving Change Project. The DVD was very well received and the local Gardaí intend to utilise it in their schools programme. They initiated a hugely successful alcohol awareness campaign targeted towards Junior Cert students receiving exam results entitled “Don’t Pour Your Dreams Away”. They have worked on Intergenerational Stereotyping and produced a DVD to increase awareness on the topic. Members have also had an opportunity to take part in local and national consultations on topics and issues that affect their lives. They have participated in cross border projects working with other young people in different communities. They have also worked with the Municipal Districts in the County on specific projects in the MD areas. To find out how you can become a member of the committee contact the Youth Development Officer on 047 73717 or email fmcentee@monaghancoco.ie. To find out Futher Infromation about the “Don’t Pour Your Dreams Away ” Go to the Facebook page titled “Don’t Pour Your Dreams Away”.